﻿Taiwan was never in my to-visit list. Don't ask me why, mixture of various reasons, really. I've heard of how friendly and nice Taiwanese are.. bla bla bla bla.. So, when hubby decided that this year, we could go to Taiwan for a change (for the past 2 years, we've been having holidays in BKK - long story cut short, coz we went back to return favor to Four-Face Buddha, as I wished for a baby there in 2010), I thought ok, we shall give it a shot. As usual, I would have to do homework and plan on our itinerary, just to be vetted by hubby for a nod of approval. I hated the planning, as I couldn't really digest what's nice to do or see or eat there. Well, I do know the infamous night markets, but I've also heard of the crowd. In short, I wasn't really looking forward to the trip, but I did feel excited for IZ, as it would be his furthest and longest overseas vacation (Malaysia excluded). The news on tainted ingredients from some Taiwanese factory didn't help. 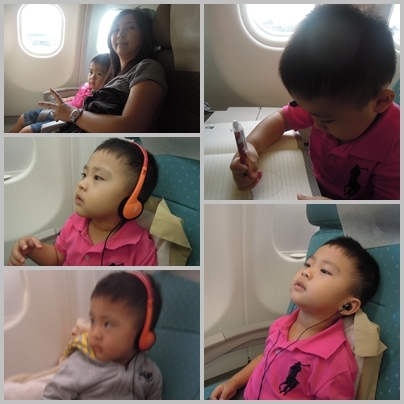 Below are pictures taken from Sg to Taichung, which was our first stop. 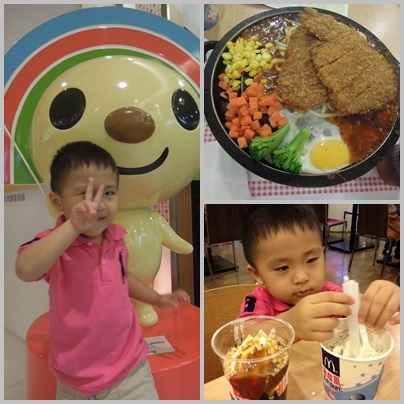 On why I chose Taichung, please read it in my review here. 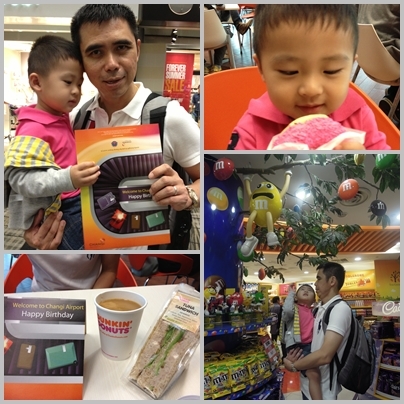 In SG airport - hubby was given a pleasant surprise, birthday voucher by ICA, and so we spent on Dunkin Donuts, no prize for guessing why.. our dear son loves their donuts! Upon our arrival in Taoyuan International Airport, we were given priority to clear the immigration, as they do have priority lanes for families with young children. The officer ushered us over. I really like that people waited behind the yellow line while waiting for their luggage, unlike what's happening in most countries, esp SG and China where everyone else are standing at the conveyor belt, you wouldn't be able to see if your bag is coming on the belt. Being a fanatic, I couldn't imagine life without internet, so I purchased a data plan. If you come out from the departure hall, you should turn to your left and then make another left turn, you'll see 3 telecommunication counters. I didn't know which to choose, so I chose the one farthest in as it had the shortest queue, and I saw the price was lower than the others. For NT500 of data plan unlimited for 7 days, I was given FOC airtime of NT150 too. It lasts us whole trip and signal was strong throughout regardless which part of Taiwan we went. We then took a bus (no. 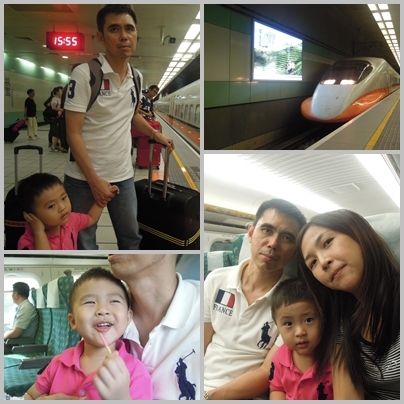 705) from Taoyuan Airport to Taichung High Speed Railway (HSR) Station for NT30 for one adult. IZ rode for free. The journey took about 15-20 mins. 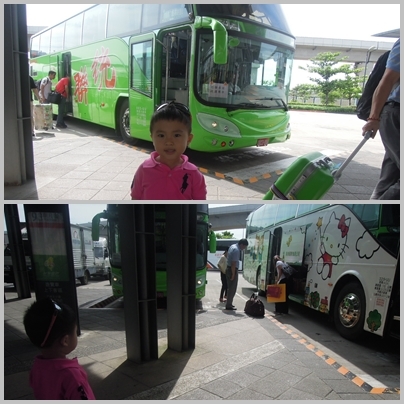 Then we bought HSR tickets to make our way to Taichung. The HSR schedule could be found on their website here. The train were pretty punctual, as you could see in the tickets picture, ETD was 1557 hours, the train arrived at 1555 hours. We then took a cab to Beacon Hotel (click on the link for review and pictures) where we put up for a night. Cost us about NT240 (approx S$10.45). On our way to Fengjia Night Market, we were recommended to the street just beside our hotel for the street food. 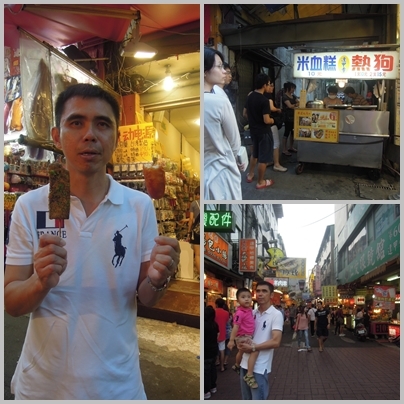 We queued for this bloody rice stick and fried breaded hotdog - they were not nice.. boo! Then the little one said he was hungry and we went into a local restaurant to fill his stomach. Looks really simple - but it was amazingly delicious that IZ almost finished the noodles! Just this one for example - can't see clearly? On a separate note, while staying near the night market has it's plus point, it was also a minus point if you're traveling with young children (read, age of need to be carried most of the times, but their weight is on the upper side of the specs, and you do not bring stroller on your vacations). If you stay just a little further, you could hail a cab from the night market, wherever you are. But if you stay near the night market, you have no choice but to WALK BACK. And then concussed right after.. I had to carry him while hubby bought drinks and queued for smelly tofu, my arms! Well, the smelly tofu was not that smelly.. another boo! Checked-out and waited for cab to send us to Taichung HSR station so we could make our way to next destination, Sun Moon Lake!